contemplative cook, teacher, & mother of a methods maven. padme of process & food mettāphorist, learning to feed the heart-mind. Munching blackberries from the back field and homemade pigs in blankets, for which we used this clearly expiration date-defying yeast in the dough, 7 year-old Otto begs the innocent question: "Mom, what's reality?" Less than crisp with the L's due to the dough, which is understandable--to me, but not to his sister. Loooong arc of an eyeroll, whilst studiously considering a single blackberry. Oh my. In this kitchen, overly crisp enunciation like that, paired with an accent stress reconfiguration?--generally means the conversation's going to bake up flat for the other person. Herein lies the entwined breadstick reality of DNA combined with several hundred thousand runs through the dough conditioner over the years. You see, in this exchange I see clearly my own rigid need for linguistic precision in others, usually vigorously kneaded into the faulty belief that if I just say the exact same thing over again more slooooowly--and the other person sees me doing this for his benefit (that "his" could be a pronoun, could be a husband)--he will somehow be more inclined to truly understand me. And I won't have to alter any of my ideas, viewpoints, or tactics. The reality is that excellent articulation still isn't clarity, and may never give rise to true understanding. "Reality," she goes on, "as evidenced by atoms, protons, hair strands, viruses, and dust motes--even the ones you can't see." I brace against the dust motes-in-a-sunny-kitchen-observation, and yet I soften as I also understand--no particular enunciation necessary. "Yes, she's right," I concede. "That's true about the unseen dust motes." Are you kidding? I shudder. Especially those little unseen things. Sometimes, I feel like I'm trapped inside a discarded scene from Madeleine L'Engle's A Wrinkle in Time, one the beloved science fiction writer snatched out of her typewriter, bunched up into a paper popcorn ball, and flung from her hands, thinking, "Oh, I can't write them like that. No one will believe two young children actually talk like that. Centaurs, yes. But 7 and 9 year olds?" I have my own eerily attuned Charles Wallace and thorny, brilliant Meg, which I guess makes me Mrs. Wallace--whom I always wanted to be when I grew up anyway--with her own lab right off the kitchen. "Oh, yeast is part of the kingdom Fungi," Ava says, in one of those mercilessly knowledgeable asides. "That was in my chemistry class." "I'm eating fungi?!?! ?," he flails. "AAAAAHHHHHHCKKK!" And then a pause and a glance at the blanketed piggy headed towards his mouth--but only a pause because fresh bread you make yourself (in any form) is good, and so there is a swallow. "Wait--what's 'the Kingdom Fungi' again, Ava?" Basically this fungi, this living thing, yeast, converts sugar (or carbs, more specifically) into carbon dioxide and, in fermentation, alcohols. The same mechanism that works (or in my case, as a former drinker, doesn't work) in beer and wine also works in the rest of life--especially in my daily quest to bake & take in the good. Because I'm interested in the taproots of things, especially words, I can tell you that the Indo-European root of yeast is yes-, meaning "boil", "foam", or "bubble." This also means that yeast contributes to positive space, not negative. In art or aesthetics this refers to what's there, as opposed to the space around it. Me: "Reality is the usable space. Reality is what we can actually see." Otto: "What about things that are too small to see?" Me: "It's whatever and however that is for each person-however it hits your eyes." Ava: "Actually, your eyes turn things upside-down, but your brain corrects for this." I feel a sudden sweet pang of relief, and tears actually spring to my eyes for what I hadn't even had the good sense to worry about: how objects translate to images in anyone's right mind. Yes, I feel gratitude for my brain, for going ahead and reducing complexity, doing something kind for me and not ever needing to tell me about it to get credit. Like when you've just had a baby, and haven't considered there will be an after labor or that you'll be starving once you get there, and some kind soul (probably another mother), uses your extra key and fills your fridge before you get home. Indeed, reality is a lot of stuff you can't see--especially kindness. And the reality is that people love my pigs in blankets because they love all pigs in blankets--it's a universal concept: little, portable, hand-held bites of love wrapped in warm dough. There's no I, Me, Mine with a concept like that, with love. A few years ago, pigs in blankets were all the rage with very chi-chi caterers in NYC and LA--all the big cities were serving them up even at very lavish events: a snortacious cyclone of hunger, which left vast, empty platters at every event. And then it went away again. I was a child of the 70s and a teen in the late, decadent 80s--I smelled a lot of cocktail parties through the walls. People like these old-style "pick-ups," like cocktail meatballs and rumaki and angels on horseback and pigs in blankets because they're retro, but also because they're starving for the past--perhaps even nostalgic for foods they never had, but feel they should have had, and let's face it, little retro foods gather people over conversation. They would feel this way about meatloaf and mashed potatoes, if they were portable. 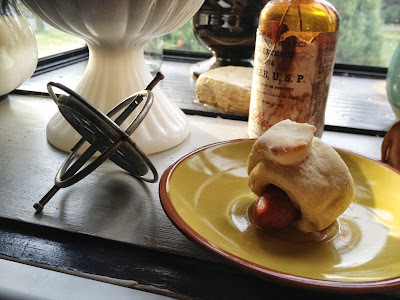 I've made a vegetarian approximation of pigs in blankets, and they were just fine, since the key component of cocktail weiners, hot dogs sausages, etc. isn't a meaty issue at all, just a salty one. You could place a pair of Vibrams in a strong brine, and I'm reasonably certain you could replicate the effect. Now, if I could make a vegan, gluten free cocktail weiner with minimal, earth-friendly packaging (read: NOT in the annoying plastic airtight thingie which you have to cut open and get the juice all over yourself), then I suppose I'd be in the business of business, not just observation. I'd also be compelled to figure out, definitively, why the word weiner is so impossibly funny--for all ages. I don't know. But it is. Say it out loud. A piece of blanket went flying out of someone's mouth. Isn't it possible that the draw here is possibility itself? 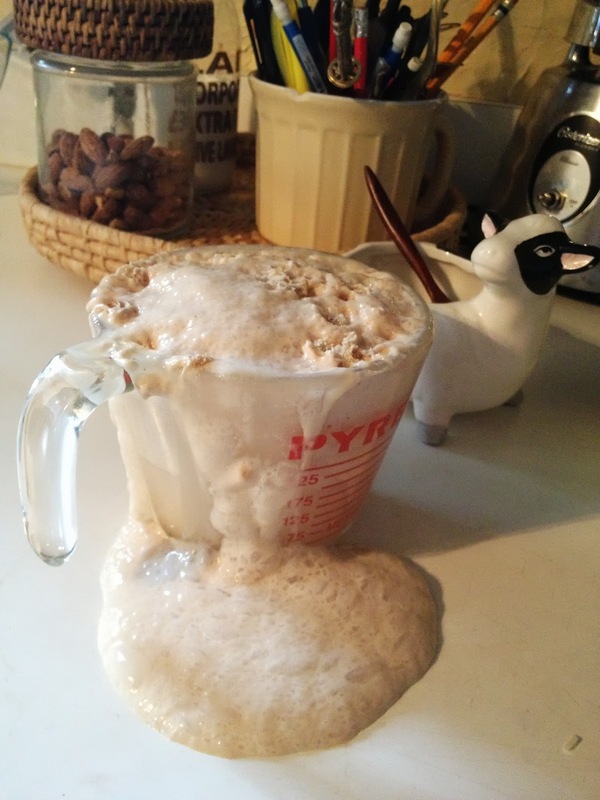 Yeast is that possibility incarnate: this could happen, given the right conditions. Buddhism teaches us that what comes out of our grist mills is the knowledge that something will happen and it will cause something else to happen. This is the nature of reality. I'll be honest: I shimmed this one with an almond to demonstrate the effect, but if you were here at this kitchen table and not in a photograph (and I wish you were), you'd have seen it, too. Something will happen. And we'll just have to see. It's what's here now that matters. The God of very small things, like yeast. And you can't see possibility working until you see it working--until you test it out. Let the happening just be. No need to anticipate, project, or hope. Just enjoy the comfort of being in the wait, because it's never "if", only "when". That's a huge relief :-). I love this one so much. You know how you get the yeast to "wake up" by feeding it a little sprinkle of sugar? It's very helpful to realize that I am not the yeast or even the sweetness, I am only the spoon. It takes the pressure off the doing and the when. I think I'd rather be a spoon than any other utensil I can not-think up. Next to the gyroscope, it's the best navigation tool out there (or in there). May you be happy. May you peaceful. May you be full. © 2012 Stacia Trask. Simple theme. Powered by Blogger.